“Aircraft giant Boeing has added a new facility to its Engineering and Technology center in Bengaluru, nearly doubling its facility in India.” – The Hindu. The above news byte, taken in conjunction with the fact that this Boeing Engineering & Technology Center was opened earlier this year in January, gives you a fair idea of the business environment that exists in Bengaluru and India, progressively becoming the most favoured destination for foreign direct investment. This dramatic change in business policies and investment framework didn’t happen overnight. It was during 1991 that the Indian economy underwent a seismic shift and opened its door to global market forces, to a larger role for the private players, and to foreign investment. There has been no looking back since 1991, as market forces have gained speed and momentum, supported and ably fostered by various government schemes and incentives. This article takes a look at a particular set of initiatives and government incentives for opening a new branch office in India. Incentive Scheme No.1: Modified Special Incentive Package Scheme (M-SIPS). This package from the Ministry of Electronics & Information Technology, was announced to achieve an $100 billion investment, to generate employment opportunities for 28 million people, to increase exports to $80 billion, and thus to march towards the goal of “Net Zero Imports” in Electronic System Design & Manufacturing (ESDM) sector by 2020. Extending the term of the scheme to 27th July 2020 from the earlier 27th July 2015. Bringing additional verticals under the scope of the scheme. The original 29 verticals were expanded to include Telecom, IT Hardware, Consumer Electronics, Medical & Automotive Electronics, Solar Photovoltaic, LEDs, LCDs, Avionics, Strategic Electronics, Industrial Electronics, Nano-Electronics, Semi Conductor chips & chip components, etc. Simplifying and streamlining the procedures for grants. 20% subsidy on capital expenditure for investments made within Special Economic Zones (SEZs). 25% subsidy on capital expenditure for non-SEZs investments. Investment threshold: Rs.1 crore to Rs.5,000 crore depending upon the project type. FDI Norms: 100% FDI allowed in ESDM sector through Automatic route except in the case of Defence Electronics Items where 26% is allowed through Government Approval route & >26% is allowed through Cabinet Committee on Security. Approving Authority: Appraisal committee chaired by the Secretary of Ministry of Electronics and Information Technology. Approval Time: Approval will be accorded to eligible applications within 120 days of submission. Incentive Validity: Incentives available for investment in projects made within 5 years from the approval date. Recipient Undertaking: An undertaking to remain in production for a period of at least 3 years after receiving the incentive. Government Initiative to further the cause: With the end objective of making India a global Electronics hub, the Government has made an all-time-high allocation of Rs.745 crore for M-SIPS and Electronic Development Fund (EDF) in the Union Budget 2017-18. The M-SIP scheme is well on track is evident from these words of Finance Minister, Mr.Arun Jaitley. “250 plus proposals for investment in Electronic Manufacturing has been received in the last two years amounting to an investment of Rs.1.26 crore”. The Business Standard. Incentive No.2: Merchandise Exports From India Scheme (MEIS). 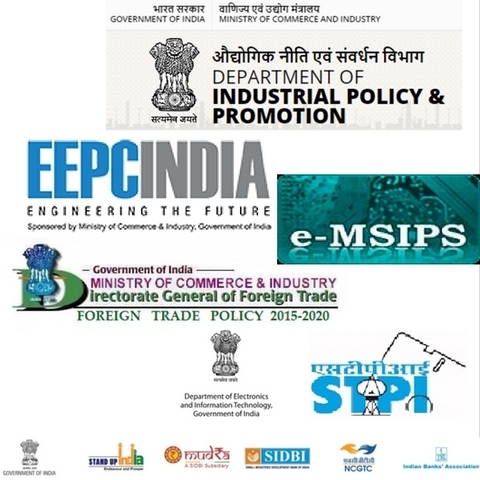 Foreign Trade Policy 2015-20 introduced MEIS as a part of Export from India Scheme, replacing 5 such other schemes covered under the earlier Foreign Trade Policy of 2009-14, with the objective of catalysing export growths in different sectors, of promoting exports to newer markets, and on the whole increase increase India’s capability in the world market. MEIS not only replaces these 5 schemes but also rationalises the incentives and expands their scope by removing various restrictions. Addition to the 8 digit (ITC HS Codes) product line under MEIS schedule, such as Medical & Scientific Instruments. Incentives to be given to all the three groups (A,B, & C). Earlier exports to group C was not eligible for incentives. Amendments to the incentive rates of some product lines already mentioned in the schedule. The realised FOB value of exports of notified goods, with emphasis on those goods which are of India’s export interest, to notified markets, in free foreign exchange at a specified rate, usually between 2 % to 5% as specified under Foreign Trade Policy 2015. Export of notified services is entitled to these duty scripts at 5% of Foreign Exchange earned. Export of notified goods by courier or foreign post office for a FOB value of up to Rs.25000/- are also eligible for benefits under this scheme. India Engineering Export has moved up from $10 million from 1956-57 to the present $65.20 billion in 2016-17. Exports for August 2017 grew at a rate of 10.29%, valued at $23818.83 million compared to August 2016 figure of $21597.09 million. Ministry of Commerce & Industry. Incentive No.3: India BPO Promotion Scheme (IBPS). Approved under the Digital India Programme, this subsidy scheme’s objectives are to balance regional growth in this sector by incentivising operations of BPO/ITES across the country (excluding certain cities as mentioned below), by establishing nearly around 48300 seats, to create employment opportunities for the young generation, and to promote investment in IT/ITES sector. Excluded Urban Agglomeration (UA) areas are Bengaluru, Chennai, Hyderabad, Kolkata, Mumbai, Pune, NCR, and States in North East region. Corpus: An outlay of Rs.493 crore up to 31st March 2019. Implementing Agency: The Software Technology Park of India (STPI), an autonomous body under the Ministry of Electronics & Information Technology. Financial support of up to 50% of Capital Expenditure (CAPEX) and/or Operational Expenditure on admissible items, subject to a limit of Rs.1 lakh per seat. Special Incentives: Special incentives provided are also subject to the upper limit of Rs.1 lakh per seat. 50% women employed; eligible for 5% special incentive. 4% Disabled persons employed; eligible for 2% special incentive. 2X Target; 5% special incentive. 2.50X Target; 7.50% special incentive. 3X Target; 10% special incentive. For setting up operations at locations other than state capital; 5% of eligible incentive. Setting up operations with Local Entrepreneur; 5% of eligible incentive. Inventive No.4: Export Promotion Capital Goods (EPCG) Scheme. An incentive scheme from the Government, covering manufacturer-exporter, to incentivise exports across sectors. Tools, consumables, catalyst,refractories for the existing or the new Plant & Machinery. Under this scheme import of capital goods for pre-production, production, and post-production, is allowed at 5% customs duty. This is subject to an export obligation, equivalent to 8X duty saved on capital goods imported under EPCG license. The period of time over which this obligation is to be fulfilled is 8 years from the date of the license. 0% customs duty on imports of capital goods against the export of Agricultural Products and value-added variants of agricultural products. If the duty saved is Rs.100 crores or more, the export obligation needs to fulfilled over a period of 12 years. India launched Make in India, its flagship initiative,in September 2014, with the objective of boosting investments and industrial production to increase the manufacturing sector’s GDP share from the present 16% to 25%, bringing into sharp focus the efforts around Ease of doing Business, FDI policies, Infrastructure development, Skill development and fiscal initiatives. A comprehensive FDI policy has been put into place by bringing more activities under the Automatic Route, by increasing sectoral caps, and by relaxing the norms. In addition to this, various Central & State Government services have been integrated into a single window e-biz portal. Department of Industrial Policy & Promotion mooted Rs.2000 crore corpus fund to provide 80% risk cover for collateral free bank credits for Startups. An option to be taxed at 25% provided businesses do not claim profit-linked or investment-linked deductions. In general, Corporate tax rate to become 25% from 30% in the course of 4 years starting from FY 16-17. Investment allowance of 15% on an investment of more than $4.17 million in any year in new plant & machinery. 30% of additional wages paid to new regular workmen employed over and above 50 workmen. 200% Higher Weighted deductions on expenditure related to R & D, subject to conditions. A transparent GST Tax regime implemented. Simplified licensing and easy security and environmental clearing process. Industrial Parks: Every State of the Indian union, without any exception, have established specialised Industrial Parks. Special Economic Zones (SEZs): Specifically demarcated area that is considered as Foreign territories for the purpose of conducting business activities with special benefits such as relaxation of customs duty and other levies. National Investment and Manufacturing Zones (NIMZ): Zones with a mixture of Production units, processing area, administrative services, logistics, and residential area. Country Specific Zones: Established for hosting Industrial units from specific countries. Sector Specific Clusters: Sector-specific; like specifically earmarked zones for Electronic Industries, Automobile Industries, mega food parks etc. Bengaluru Mumbai Economic Corridor (BMEC). Amritsar Kolkata Industrial Development Corridor (AKIC). Chennai Bengaluru Industrial Corridor (CBIC). East Coast Economic Corridor (ECEC). Chennai Vizag Industrial Corridor (CVIC). Dedicated Freight Corridors: Surging power needs, rising international trade, and burgeoning infrastructure activities has made the concept of dedicated freight corridor the need of the moment. Western Dedicated Freight Corridor: 1468 km. From Dadri, Uttar Pradesh to JNPT Mumbai. Eastern Dedicated Freight Corridor: 1760 km. From Ludhiana, Punjab to Dankuni, West Bengal. East-West Dedicated Freight Corridor: Bridging the 2000 km between Kolkata & Mumbai. North-South Dedicated Freight Corridor: 2173 km. Connecting Delhi & Chennai. East Coast dedicated Freight Corridor: 1100 km. Between Kharagpur in the east with Vijayawada in the south. South-West Dedicated Freight Corridor: 890 km. Connecting Chennai in the south with Goa in the west. Government Of India’s MSME schemes. Stand-up India features (Central & States).